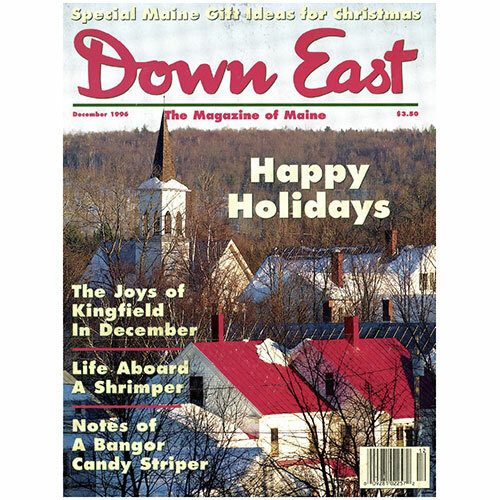 Opinions and advisories on stinky Christmas trees, clumsy weathermen, and the passing of one of Maine’s best friends. People who return winter after winter to this village in the Carrabassett Valley say it’s one ski town that hasn’t forgotten its roots or sold its soul. By Powell Boyer. Ken Textor boarded a shrimp boat out of Cundy’s Harbor to find out just what’s involved in fishing for this delectable shellfish. Ken Kantro’s beguilingly simple designs are all centered in Maine — but with Celtic, Southwestern, and Mexican influences, and even a little Escher thrown in. By Elizabeth Peavey. Two crusading educators have invested twenty-four years in building a unique model school in Camden, but they didn’t do it alone. By Sarah Scott. Ski mogul ks Otten recognized years ago that in his business snow is money. Today he makes more of both than just about anyone else in the industry. By Jeff Clark. As a candy striper at a Bangor hospital in 1964,1 thought I might find the dashing young doctor right in my hometown. What I found was something quite different. By Deborah Dalfonso. The governor’s mansion in Augusta has seen its fair share of canine and feline residents, but it’s also been home to a bear cub, some alligators, and a tame squirrel. By Ellen MacDonald Ward. When George French photographed a frigid Parsonsfield backyard in the 1930s, he captured a scene that could have existed 100 years earlier. By Ellen MacDonald Ward. I have voiced my uneasiness in this space before about the plans for the new world as shaped by the Internet and cyberspace sovereignty, and while I don’t understand a lot of it I know that a universal structure is being prepared to contain and control all of the information on all of the subjects covered in the history of the world. By Caskie Stinnett. Cover: Rooftops of Kingfield, by Randy Ury.